The new tax law is boosting the economy more than initially thought. After the election of November 2016, the Standard & Poor's 500 rose sharply, coinciding with the growing likelihood the law would be adopted. Then, in the weeks after the legislation was signed on December 22nd, Wall Street analysts sharply hiked their earnings estimates for the S&P 500, and stock prices soared to start the year. Earnings expectations are surging and earnings are ultimately what drive stock prices. 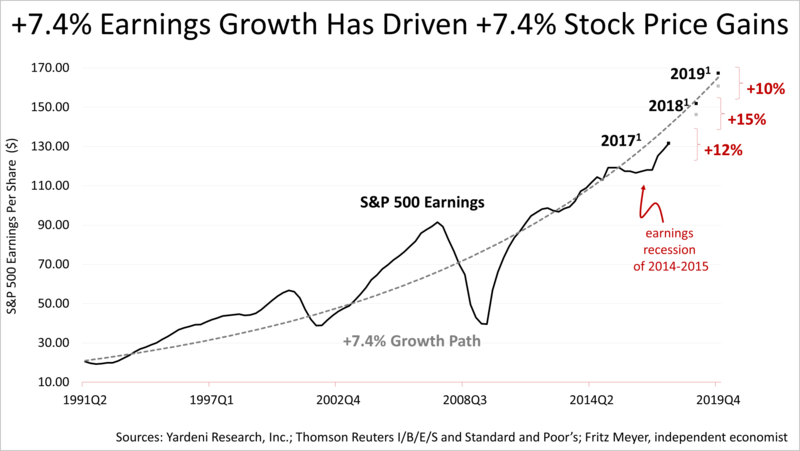 Since 2001, earnings on large-company stocks averaged a growth rate of 7.4%. But earnings are not expected to grow a mere 7.4% annually in 2017, 2018, and 2019 - they're expected to grow 12%, 15% and 10%, respectively. 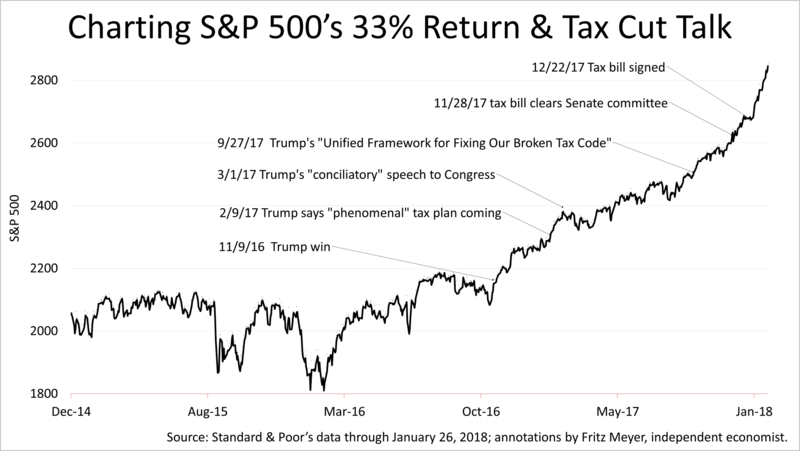 After the new tax law was signed, the average company in the S&P 500 was expected to see profits of $131 a share in 2018. In January, however, expectations were revised upward to about $152, and that is likely to be revised higher still in February. By historical standards, earnings surges are unusual but not without precedent. Still, you have to wonder how much longer the good times can last. The consensus of 68 economists surveyed in early January by The Wall Street Journal was for strong growth, averaging 2.7% quarterly through 2018. Meanwhile, the Conference Board's Leading Economic Indicators - a forward looking index - surged at the end of 2017 and the business group's economists cited the new tax law as a tailwind to the expansion. In addition, the International Monetary Fund also cited the new tax law in upping its latest quarterly projection for world growth in 2018 and 2019. But the key to the sustainability of the virtuous economic cycle is the American consumer, and the data on gross domestic product released in late January showed consumer strength remained intact. GDP is comprised of four factors and consumer spending is by far the most important, accounting for 69% of U.S. economic activity. If consumers keeping spending, the good times could keep on rolling. In February, a lower rate of withholding federal taxes on paychecks kicks in, putting more money in consumers' pockets to spend. While the future looks very bright, plenty could go wrong. A constitutional crisis looms larger, the nuclear standoff with North Korea is on a hair trigger, and investors could suddenly turn their focus to the $19 trillion U.S. debt and the nation's unsustainable fiscal path. A 10% or 15% drop could occur in a flash at any time, and chances of a bear-market decline of 20% or more increase as the nine-year bull market grows older. In addition, the new tax law increases the chance that the Federal Reserve will make an interest-rate policy mistake - by quashing growth or allowing the economy to overheat and inflation to surge. Fed mistakes caused every recession in modern U.S. history. Despite these risks, earnings are surging and that's what ultimately drives stocks. In addition, consumers are spending and that's what drives the economy. With no sign of a recession and all major economic indicators signaling growth, the bull market and expansion could continue for months and soar much higher. Stocks are an important part of a diversified portfolio - they're the main growth engine in portfolios. But remember, stocks won't always appreciate and are only one part of a diversified portfolio, and diversification neither assures a profit nor guarantees against loss in a declining market. With stocks appreciating so much in the past year especially, be sure you are rebalancing properly and count on us for prudent portfolio management based on economic fundamentals and quantitative analysis.